The What: AmpliVox has launched a wireless personal PA that delivers sound amplification with portable, hands-free convenience. The What Else: The Digital Belt Blaster is designed for comfort, convenience, and flexibility of use. Weighing less than a pound, the three-inch speaker pairs with the wireless headset for sound that easily reaches audiences of up to 100 people. In addition, the unit offers a USB port and SD slot for music playback, and a mic port for users who prefer a wired handheld microphone. The system runs on a rechargeable lithium battery that provides up to 18 hours of use per charge. It comes with fitted belt carrying case to protect the unit and allow for easy access to controls. 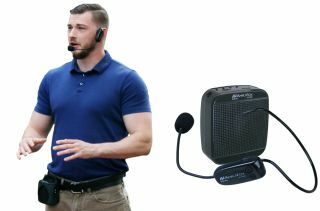 The Bottom Line: The new S208 2.4 GHz Digital Belt Blaster combines a wireless headset microphone with a compact beltpack speaker to amplify speech for teachers, coaches, tour guides, product demonstrators, and other presenters.